The long awaited seventh book in Elizabeth Haydon's critically-acclaimed epic fantasy series, the Symphony of Ages. The war that they had feared is now upon them. Ashe and Rhapsody, leaders of the Cymrian Alliance, are gathering their allies to combat the machinations of Talquist, who will soon be crowned emperor of Sorbold. Gwydion Navarne remains by Ashe's side. Anborn, Lord Marshal, has taken to the field. And Rhapsody has been forced into hiding to protect the life of her infant son. The Merchant Emperor of Sorbold has unintentionally allied himself with a pair of demons and has begun targeting the dragons that remain on the Middle Continent. Talquist will stop at nothing until the Cymrians are wiped out and the entire continent and the rest of the Known World is under his rule. Assailed by danger from all sides, surrounded by lies and intrigue, Rhapsody is left with one undeniable truth: if their forces are to prevail, she must join the war herself, wielding the Daystar Clarion, an ancient weapon whose power is nearly unparalleled. As she struggles to reconcile her duties as a mother and ruler, a danger far more devastating than Talquist is stirring beneath the surface of the land itself. 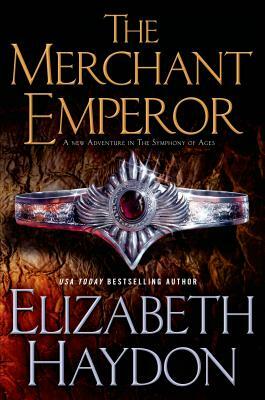 In The Merchant Emperor, beloved characters are forced to make soul shattering sacrifices. Bestselling author Elizabeth Haydon has delivered a breathtaking seventh installment to the Symphony of Ages. As the daughter of an air force officer, USA Today bestselling epic fantasy author ELIZABETH HAYDON began traveling at an early age and has since traveled all over the world. She draws on the imagery of these visits in the Symphony of Ages series, and blends her love of music, anthropology, herbalism and folklore into much of her writing. Haydon is also a harpist and a madrigal singer (a singer of medieval songs). She lives with her family on the East Coast.